Since the first travel websites were created in the mid 1990s, travel and the web have been completely intertwined. In fact, travel websites are some of the first adopters of new web technology and design trends. A far cry from early travel directories and internet portals, today’s travel websites are on the cutting edge. 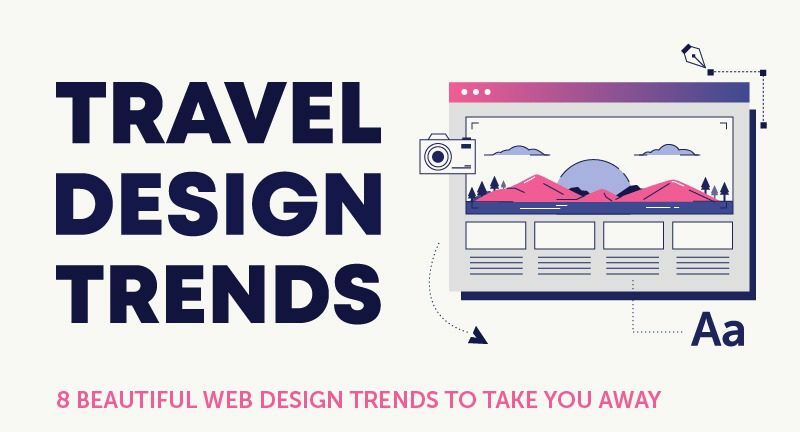 We did the research and highlighted our favorite up and coming travel web design trends for 2019 and beyond. 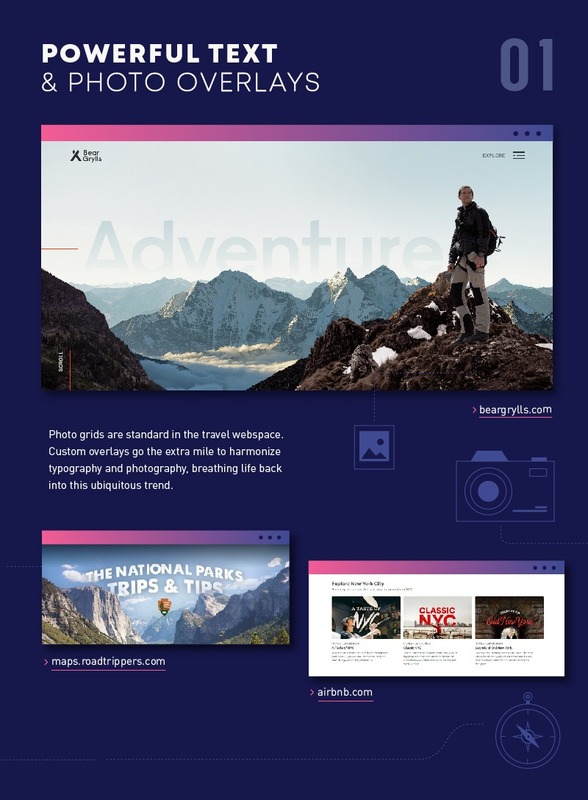 Photo grids are standard in the travel webspace as they offer a functional way to display a catalog of destinations, trips, or offerings. But if what you are promising visitors is a unique and customized experience, go the extra mile to create beautiful graphics that harmonize photography and typography. Dynamic overlays breathe life back into this ubiquitous trend with attention to detail and perspective. Hero images are overdone on the web in general, but if any one industry is particularly guilty of milking the full-page photo atop horizontal blocks for all it is worth, it’s the travel industry. Luckily, many travel sites are beginning to turn the hero image on its head. Pages split vertically put distinct elements on the same plane, give both photo and text equal visual importance, and create attractive contrasts. In this busy, iPhone-obsessed era, “getting away from it all” is increasingly coming to mean leaving the overstimulation of big cities, wifi, and corporate hospitality behind. Rather than highly saturated photos of sunny resorts filled with tanned bodies and smiling faces, many travel sites are opting to use more subdued, minimalist photography to showcase their destinations. Pictures of misty mornings, empty alleyways, and wide open spaces invite visitors to breathe deep and clear their heads. We love this trend as it give the design an intentional, authentic feel. Maps are a natural design choice for the travel industry. Both utterly useful and incredibly inspirational, they give visitors a glimpse into the surroundings that await them. Even better still are the interactive maps that allow users to virtually visit the unique experiences that the destination has to offer. Faster broadbands speeds and better web frameworks allow designers to create technologically advanced interactive experiences that are truly better for the user. 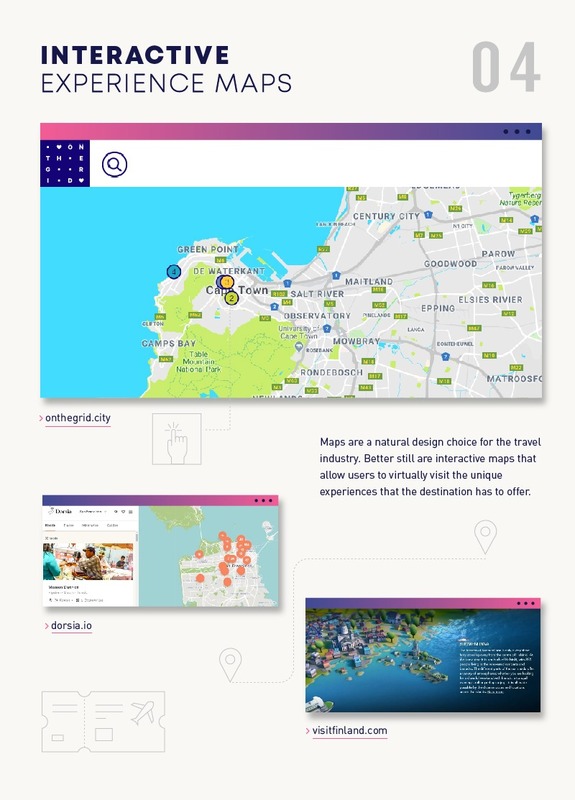 Using these maps on your travel site gives customers a chance to explore the locale before their trip. 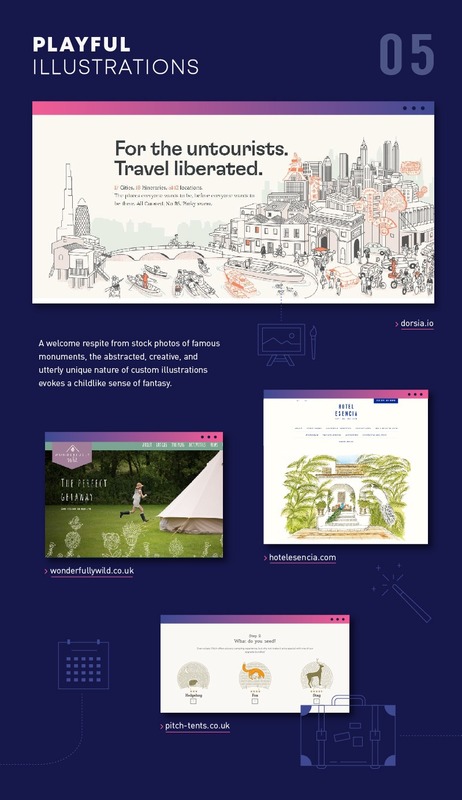 Photography may be the bread and butter of the online travel space, but custom illustrations can create a truly memorable aesthetic for your site. Not only are these illustrations a welcome respite from stock photos of famous monuments, but their abstracted, creative nature also evokes a childlike sense of fantasy. After all, travel is supposed to be fun! Is there any better source of design inspiration than Mother Nature herself? 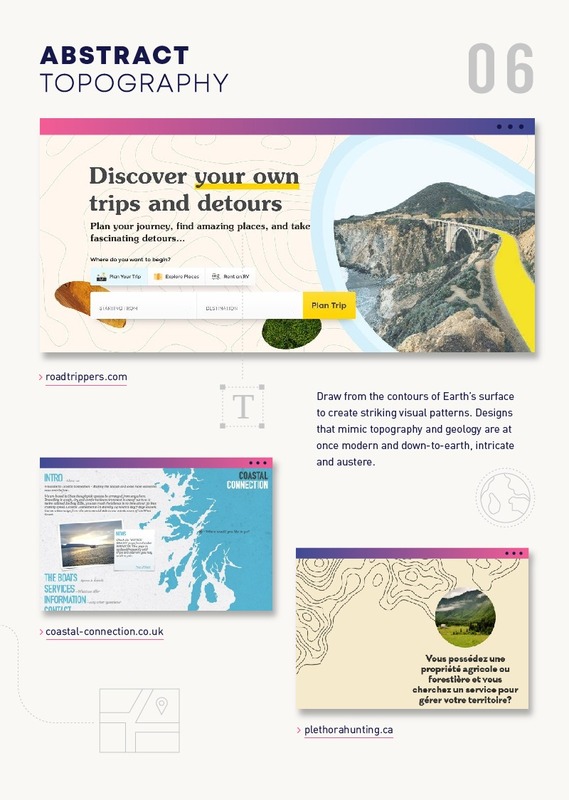 Draw from the perfect irregularities of the Earth’s surface to create striking visual patterns to complement the content of your travel site. Designs that mimic topography and geology are at once modern and down-to-earth, intricate and austere. 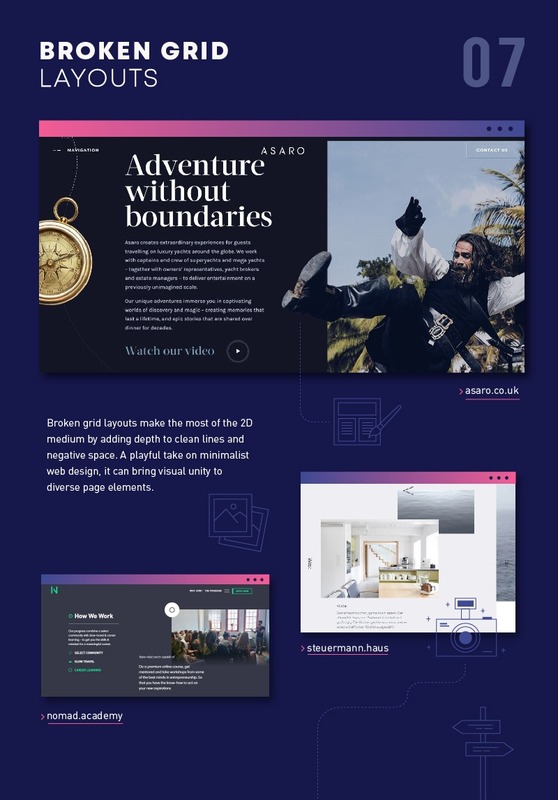 Busting out of the confines of traditional stackable web templates, broken grid layouts truly make the most of the 2D medium by bringing the appearance of depth to clean lines and negative space. 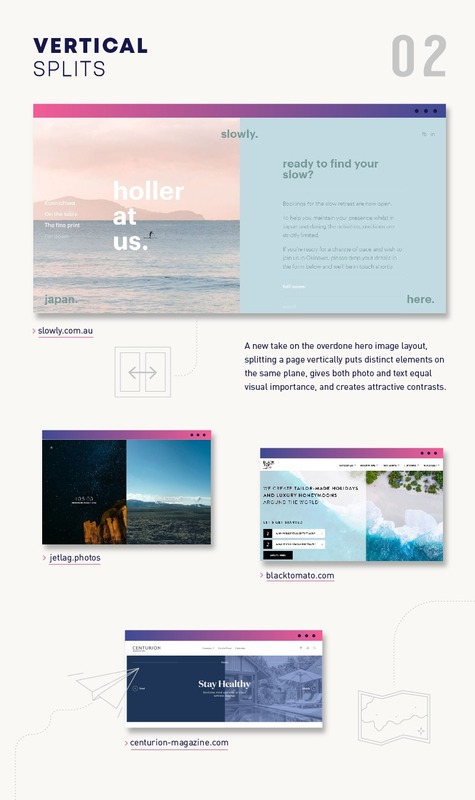 This sleek yet playful take on minimalist web design is perfect for the travel industry. 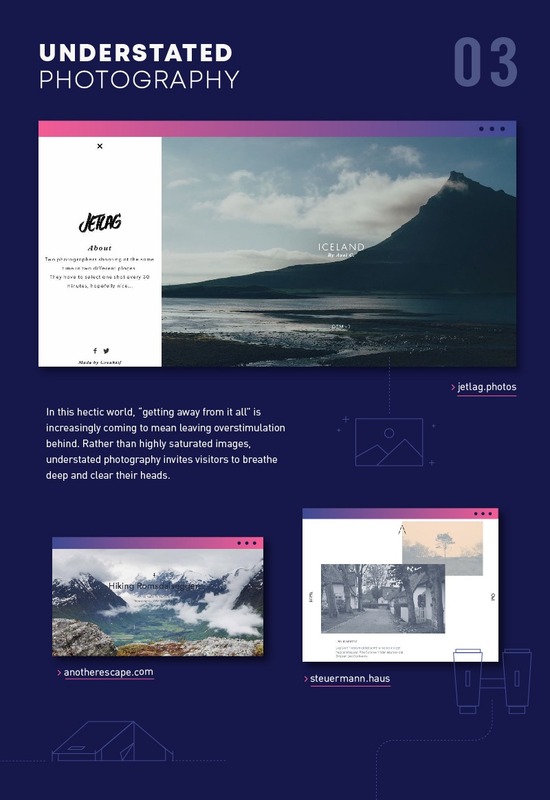 Broken grid layouts can harmonize calls-to-action, photography, and package descriptions in a way that is chic, fun, and uncluttered. Allow the over-planners among your customers to breathe easy with delightfully simple and informative travel itineraries. The perfect marriage between map and timeline, these vertical itineraries are a light and breezy way to convey route information that could otherwise be stressful for the customer to navigate.